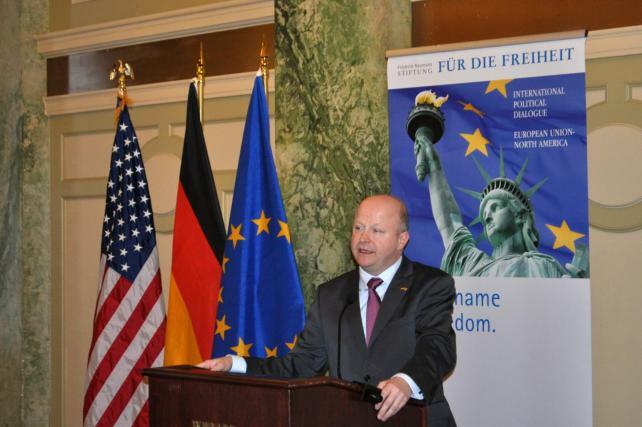 The timing of the event organized by the Transatlantic Dialogue Program of the Friedrich Naumann Foundation for Freedom couldn’t have been better: While EU leaders held another summit to try to agree on their long-term financing, Michael Theurer, Member of the European Parliament and Chair of the Budgetary Control Committee, addressed a full Luncheon assembly in Washington, DC. His talk on Europe and the Sovereign Debt Crisis was a focused discussion of the continued challenges facing the European community in the face of prolonged economic crisis. Right in the beginning the Member of the European Parliament pointed out that “the Euro Crisis is not a crisis of the European Union, but that the EU has to deal with sovereign debt crises of single EU Member States.”Mr. Theurer spoke with great concern to systemic problems that he believes to be at the core of European economic woe, suggesting that the institutional framework of the Euro Zone be reviewed at the European Summit in Brussels as an immediate place to start. He championed furthering and speeding-up European political unity, especially in the face of the disastrous economic and political implications of splitting up the Euro Zone. European-Level economic governance would prove effective. Mr. Theurer’s focus on institutional and systemic solutions is furthered by the notion that injecting liquidity into struggling states through European investments is not a sustainable measure and its effectiveness is uncertain. These issues need to be addressed through domestic capacity building. In a global economy where some European states might not be competitive enough or able to keep up with technology, it is necessary to target promising investments. Supplying small and medium enterprises with investments and bolstering vocational training will increase a state’s overall ability to absorb invested funds. According to Theurer the German educational system could set an example for other EU countries. He pointed out that Spain has already expressed its interest in reforming the country’s educational system. While addressing systemic problems is critical, in the meantime it is important that Europe looks toward rescue umbrella funds to prevent conditions from deteriorating. Mr. Theurer believes it important that these bond programs are paired with strict structural requirements for recipient states. This is not in an attempt to give “shock therapy” but to reset states to a growth path after zeroing out. The demands of continually floating debt are beyond the capabilities of finance, making even more critical the mobilization of various sectors of society to a secure structural fix. Demographic trends of a declining labor pool and rapidly growing markets outside of Europe make clear the importance of technological growth and European innovation. Mr. Theurer suggests this can be done by constructing a Federal union of institutions that are capable of coping with crisis while empowering the civil lives of people so they can overcome problems and bring development.